Located opposite Monterrei fortress, the Verin Parador has wonderful panoramic views of the town of Verin with a background of the vineyards. The design is that of a traditional Galicia country house with a fortified tower.. The interior offers the guest a pleasant, welcoming and quiet atmosphere. The bedrooms occupy the two wings of the house. and are decorated with ochre shades and wooden floors. They have views of the beautiful large garden, the swimming pool and the castle. The menu in the restaurant has international dishes and the local cuisine in which the chef specialises. There is also a special menu for those wanting a gluten free diet. Shoulder of pork with parsnip tops. In Verin, visit the churches of Santa Maria la Mayor and la Merced, and the "Casa del Asistente". Monterrei is an old village looked over by the castle. Make sure to see the Palace of the Condes which was built in the 15th century. In February, go to the carnival of Verin on Shrove Tuesday. There are also the Summer festivals which are held in August and the Three Wise Men Parade which is celebrated every 5th of January. Visit the Invernadeiro Natural Park which is an ideal place to go walking, cycling or riding. 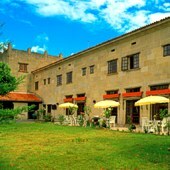 Near the Parador of Verin you may also swim, take riding lessons or go on a boat trip. 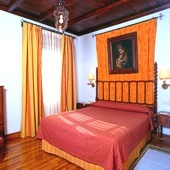 This Parador has twenty two twin bedded rooms and a suite. All the rooms have air conditioning, telephone, television with canal plus, safe and mini bar. The hotel has central heating and air conditioning in the dining room and bedrooms, lift, parking facilities (without security and limited places), piped music, free internet wireless, garden with a children's playground, a seasonal swimming pool, restaurant, bar and facilities for the disabled. There are facilities for business meetings. Distance from the nearest airport is approximately 180 kms, train station is 35 kms away and the nearest port is 180 kms away. I stayed in September 2014, sadly only for one night. What a lovely and charming residence. the view of the valley was amplified by the beautiful sunset over the mountains as seen from my room. I rarely eat anything fried, however....the eggs at breakfast the next morning were the best ever. Dinner was lovely, the room charming and the staff were extremely helpful. I would recommend this to anyone. O Parador é próximo de Portugal e a viagem faz-se bem a partir de Chaves. Minha família gostou muito de ficar no hotel, especialmente porque a sua localização inspira tranquilidade e oferece vistas excelentes pela zona que circunda o Parador. A decoração, embora não sendo exuberante, remete para a história desta região. Gostei bastante e voltaria a ficar neste Parador se tiver oportunidade. 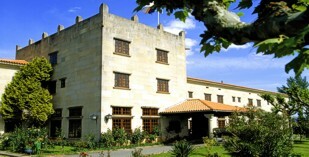 Parador de Verin in a Galician country manor converted into a three star hotel.